David Morine's long love affair with Maine began when he was a boy in 1946 and his parents rented their first lakeside cabin in Fryeburg. At first skeptical about the cost and the lack of plumbing or electricity, the Morines quickly felt right at home. There was plenty of good fishing and good company to fill the long summer days. Although David didn't know it at the time, his career began to take shape that summer when he first splashed his feet in the pristine waters of Lovewell Pond. He went on to become an internationally recognized conservationist and served for fifteen years as the head of land acquisition for The Nature Conservancy. He is also a natural storyteller, and he recounts the fondly remembered pleasures of family vacations and reveals many adventures and misadventures he had along the way. 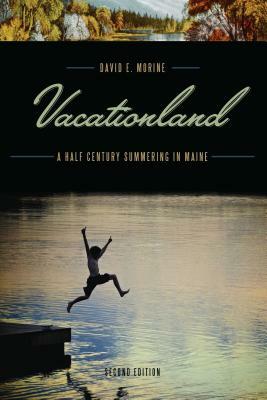 This second edition of Vacationland includes the same wonderful, quirky personal stories as the first edition, along with four new funny and nostalgia-filled tales about summering in Maine. David Morine graduated from Amherst College and received an MBA from the University of Virginia in 1969. He directed the land acquisition efforts of the Nature Conservancy during the 1970s and 1980s. His articles and short stories have been published in Sports Illustrated and Down East.